As you may or may not know, I’ve got some big bicycle touring plans for 2014. I’m going to be cycling across at least 14 different countries this year… and maybe more (United States, Mexico, Germany, Austria, Slovakia, Hungary, Poland, Lithuania, Latvia, Estonia, Finland, Sweden, Norway, Denmark and Taiwan). I’m going to be participating in three self-guided bicycle tours that you are welcome to join me on… and I’ll be spending approximately seven total months this year on my bike. It’s going to be an epic year of bicycle touring and I can’t wait for it to begin. But I’m not on the road just yet. I’ve rented out my home for an entire year and am currently crashing with my parents in Southern California. Over the last several weeks I have been featured on the cover of Ventana magazine, attended a major Los Angeles art show, participated in a Police ride-along, saw the musical performance of “The Book of Morman”, and have done a fair share of local bicycle touring. Cycling through the African country of Lesotho on the cover of Ventana magazine. My favorite piece of art from the Los Angeles Art Show. This is me on my recent Police ride-along in the city of Camarillo, California. My most pressing project, however, has been working to get a visa for my 5-month stay in Europe this summer/fall. Because I’m planning to be in Europe for more than three months and under normal travel situations would be breaking the law because I’d be in the Schengen area for more than 90 days, I’m having to get a special visa that will allow me to remain in the area for the five month period that I have planned. I’ll talk more about what kind of visa I am getting and what I’ve had to do in order to get the permission I need to stay in Schengen Europe for more than three months in a future blog post. For now, however, just know I have gathered all the necessary paperwork needed for my visa application and I will be going into Los Angeles next week to apply for my visa. If everything goes well with the visa application, I plan on immediately booking a flight down to Cabo San Lucas, Mexico with my bicycle and all my other gear in tow. I’m not going to book the flight, however, until I know that I have my European visa sorted out. So, if things go well at my visa appointment, I should be down on the southern tip of Baja Mexico before the end of February, 2014. If things don’t go well at my visa appointment, Mexico will have to wait until I come up with a new plan for obtaining a European visa. If I make it to Cabo San Lucas, Mexico, I’ll assembled my bicycle there and then ride north for approximately three weeks before reaching my aunt and uncle’s house in the San Diego, California area. I’m planning to stay with my aunt and uncle for a week or two… and then I’ll continue cycling north for a few days back to my parents’ house in Ventura County. Me cycling along the bicycle path near the pier in Ventura, California. At this point, I’ll only have a few weeks left before my flight to Europe on May 13th and the start of my 6-month bicycle touring adventure around the Baltic Sea and Taiwan. Between applying for my visa and preparing to cycle all of Baja, Mexico, I’ve been doing a lot of fun things lately. I’ve been meeting up with some of my old friends from California (some of which I have not seen in more than a decade), and I’ve been playing in a weekly game of trampoline dodgeball in the Los Angeles area. It’s been a blast! Post by Bicycle Touring Pro. Watch the video above to see what I did during the month of January, 2014. I’ve also recently released all of my popular bicycle touring books in paperback form. The Essential Guide To Touring Bicycles, Winter Cycling, and Stretching For Cyclists can now all be purchased either as digital ebooks or as traditional paperback books that are mailed to your home. In addition to all this, I’ve just released a new bicycle touring WordPress blog theme that you can use to create your very own bicycle touring blog or website. The reaction to the design thus far has been overwhelmingly positive and it’s great to see that so many people are benefiting from all the hard work I put into this project. If you are interested in learning how to create your own bicycle touring blog or website so that you can document your cycling adventures online and share pictures, stories, maps and videos from your trip with your friends and family back home, be sure to grab my free blog/website creation guide, “5 Easy Steps To Creating A Bike Tour Blog“. The biggest project of all that I’ve been working on lately is a new and improved version of “The Bicycle Traveler’s Blueprint”. “The Bicycle Traveler’s Blueprint” is my best-selling how-to bicycle touring book about how to plan, prepare for, and execute the bicycle tour of your dreams. Thousands of people from all over the world have used the information in this text to help themselves conduct incredible bicycle touring adventures in various locations all across the planet. While the book has done an excellent job of helping so many people conduct amazing bicycle tours, I’ve recently decided that I still have a lot more I want to do and say with “The Bicycle Traveler’s Blueprint”. So I’ve been working for the past several months to turn “The Bicycle Traveler’s Blueprint” into, not just an incredible bicycle touring resource, but the best how-to bicycle touring book that has even been created. I’m doing this in part by adding hundreds of pages of new content and information. But more than anything, I’m working to change “The Bicycle Traveler’s Blueprint” into something that is more than just a how-to book, but is more of a how-to course designed to walk you through everything you need to know before conducting a bicycle tour of any length or kind. The new book will come with worksheet pages and in-depth chapter summaries that help you to not only understand the many facets of bicycle touring, but act as a training tool to mentally and physically prepare you for the life of a bicycle traveler. The new version of “The Bicycle Traveler’s Blueprint” should be finished by around the first of April, 2014 and when it is released it should be well over 400 pages long, contain more useful information than any other cycle-touring guide on the planet, and, I hope, will catapult itself into the bicycle touring history books. It’s going to be amazing… and I can’t wait to share it with you. Me working in the backyard of my parents’ home in Southern California. So, that’s what I’m currently working on at the moment. I’m getting my European travel visa sorted out, I’m preparing for my Baja, Mexico bike ride, and I’m working on the new and improved version of “The Bicycle Traveler’s Blueprint”. 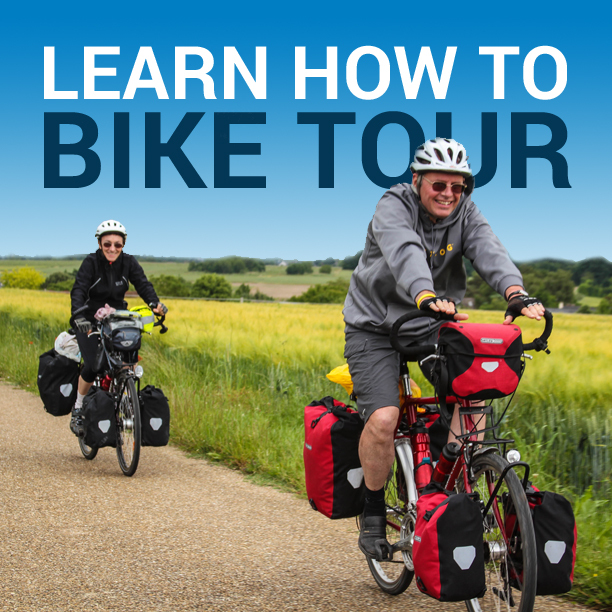 If you haven’t done so already, be sure to grab my free 12-part bicycle touring email mini-course and learn what it takes to conduct the bicycle tour of your dreams! Thanks for reading and stay tuned to BicycleTouringPro.com for more amazing photos, videos, stories and how-to information over the next several days, weeks and months. And be sure to follow the adventure online at Facebook, Twitter, YouTube, Instagram and Pinterest. 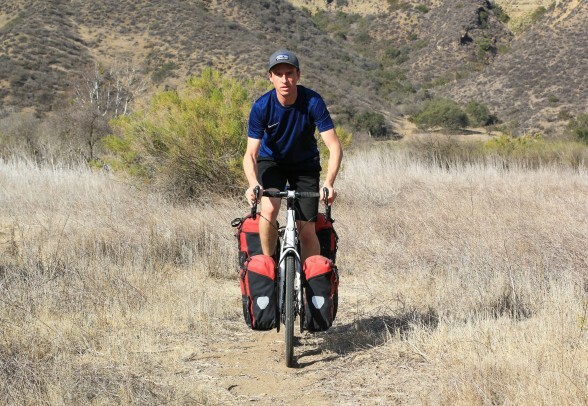 This entry was posted in Bicycle Touring Pro Articles, Darren Alff's Bike Tour Blog and tagged bicycle touring, mexico, schengen, trampoline dodgeball, travel visa, update, visa, visa application, what i've been doing, wordpress blog theme. Who do you apply to to get your lengthy visa since you will be travelling through many countries? I’ll talk about that in a future blog post. It’s a long and somewhat complicated answer… and I’m not 100% certain I will get the visa at this point. Once I get the visa I’ll tell you how I did it.